FRAMINGHAM, MA, April 10, 2019 – The Travel Institute announces migration of its current online educational courses format to a best-practice, interactive, e-Learning platform to improve both the student experience as well as student retention rates. “Continuing our primary focus on delivering the high-quality, industry-leading content our students have come to expect, our move to this new platform further demonstrates our focus on supporting student success,” shared Diane Petras, CTIE, president, The Travel Institute. 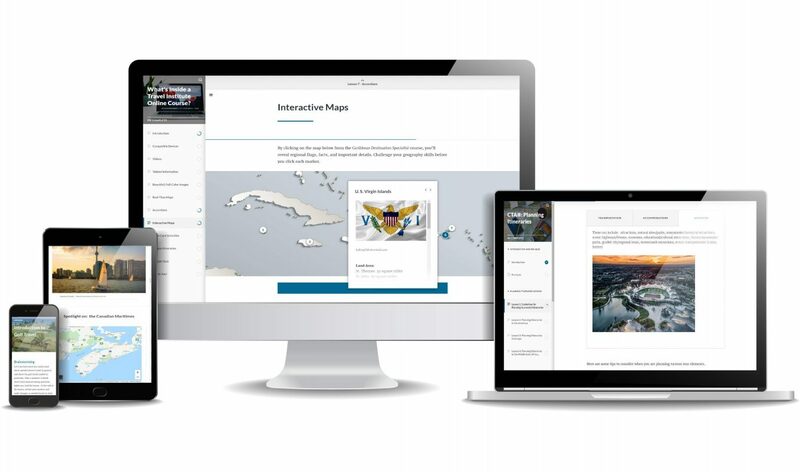 “With interactive exercises, increased use of images, enhanced navigation, mapping capabilities, progress quizzes and much more, we’re blending the capabilities and content we see as most beneficial to travel professionals who want to maximize educational opportunities and advance their career,” Petras enthused. In addition to an improved learning experience, students using the new platform are also expected to benefit from improved retention of their newly found expertise in a variety of subjects including business and interpersonal skills development, destination information, niche marketing, and other categories. “It’s widely understood today that students best engage and learn in a variety of ways including visual, auditory, and experiential,” said Guida Botelho, CTIE, director of training, The Travel Institute. “Taking advantage of today’s best-practice Web technologies, The Travel Institute is ensuring our content connects most broadly with various students’ learning styles and, ultimately, that our students experience increased retention of what they’ve learned and that they are able to then use it in their careers each day,” Botelho explained. Luxury: Ready to be a luxury travel “designer?” Capitalize on this growing market by learning how luxury travel bookings are about providing clients with customized, unique, and authentic experience rather than simply about cost. Creating these itineraries, and attracting the customer who will ask for them, is the focus of this multi-lesson course featuring expert insights, trends, products, and, of course, effective selling strategies. Golf: Golfers take their passion seriously and want a travel professional who does too. Understanding specific golf “talk,” the Golf Travel Specialist program demystifies destinations and needs of golf travelers, allowing you to grow your business or bring your passion to work too! Identify and qualify the right clients, suggest the right areas and attractions that match their lifestyle, interests, and experience. Upon completion of the course, take the closed-book exam and earn “Specialist” standing. Northern Europe: Available May 1, the Northern Europe course is the first in a new 3-part series for Europe and includes both Scandinavia and The British Isles, both popular destinations for novices and seasoned travelers alike. Featuring new and updated content from sample itineraries, key landmarks and attractions, tips for traveling in the region, cultural nuances, language, seasons, dress, customs, currency and much more for both urban and remote areas. Available now for pre-order, travel professionals will also gain specific sales tips and niche market advice. Certified Travel Associate, CTA®: Available July 1 with newly refreshed curriculum, the CTA course was written by subject matter experts and covers 15 critical areas of study designed to teach travel agents to become travel professionals. The online learning experience is in-depth, thought-provoking, and delivered in a variety of blended learning formats. The new CTA program is a practical, real-life approach to your on-the-job success. Further supplement the CTA and ensure your success with “After Hours” study groups and certification test prep options, including student mentoring. A collaborative industry effort created in 1964, The Travel Institute has continuously evolved to maintain its role as the global leader in industry education and certification while staying true to its mission: dedicated solely to advancing the professionalism of both agents and industry leaders in support of individual and industry success. A non-profit, independent organization, The Travel Institute also works with leaders throughout the industry to create and deliver relevant, meaningful and rigorous coursework. Using exclusive proctored, closed-book testing to ensure its graduates earn credentials that demonstrate the highest standards of expertise and service, The Travel Institute has certified more than 25,000 Certified Travel Associate (CTA®), Certified Travel Counselor (CTC®), and Certified Travel Industry Executive (CTIE®) graduates and also administers the Travel Agent Proficiency, or TAPSM, exam to confirm students new to the industry demonstrate a mastery of travel industry basics. A trusted partner to industry suppliers and educational institutions, The Travel Institute has trained hundreds of thousands more through additional courses, webinars, and in its online Premium Member Lounge. Throughout North America, many successful agents and high-profile leaders credit their success to coursework from The Travel Institute. Learn more at The Travel Institute.